What is most important is that we change our lives to put God in the first place. 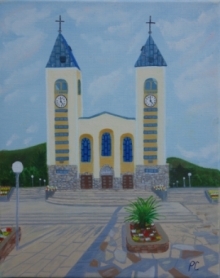 Although a good percentage of those of other faiths that visit Medjugorje do convert to Catholicism, it is only because of what they see in the Catholic faith. The Catholic Church is the original Church founded at the time of Jesus. Through the Eucharist, and the rest of the Sacraments of the Church, the most is given to Catholics and the most is also required. If you have questions about the Catholic faith please do some research. There are many good books which will help you understand the incredible richness of the Catholic faith.